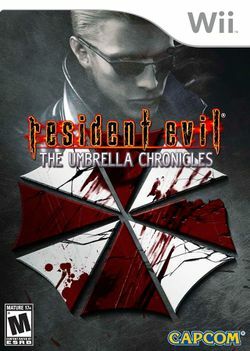 Resident Evil: The Umbrella Chronicles, known as Biohazard Umbrella Chronicles in Japan, is a rail-shooting game from Capcom for the Wii. Umbrella Chronicles is mostly a recap of events from past Resident Evil titles. It also reveals new twists behind the older titles, and includes a brand-new scenario that explains the downfall of the Umbrella Corporation. The game is split into four main scenarios, each consisting of multiple subscenarios. "Train Derailment" is based upon Resident Evil Zero and consists of two subscenarios: "Train Derailment" and "Beginnings". "Mansion Incident" is based upon Resident Evil and consists of three subscenarios: "Mansion Incident", "Nightmare" and "Rebirth". "Raccoon's Destruction" is based upon Resident Evil 3: Nemesis and parts of Resident Evil 2 and consists of three subscenarios: "Racoon's Destruction", "Death's Door" and "Fourth Survivor". "Umbrella's End" is a completely new scenario that consists of two subscenarios: "Umbrella's End" and "Dark Legacy". There is also a bonus scenario called "Special Stage". It is not known what the story behind this scenario is. Umbrella Chronicles contains a vast array of weapons. You always have a Handgun of some sort as a default weapon. The other weapons that can be found are: Assault Shotgun, Shotgun, Shotgun SA, Submachine Gun, Automatic Pistol, Submachine Gun HP, Grenade Launcher, Grenade Launcher HP, Grenade Launcher AT, Magnum Revolver, Magnum AT, Hand Cannon, MRL, Rocket Launcher and Anti-Tank Gun. The cast of playable characters includes Rebecca Chambers, Billy Coen, Jill Valentine, Chris Redfeild, Carlos Olivera, Ada Wong, HUNK, Albert Wesker and a character whose identity is not yet known. It is compatible with the Wii Zapper, although the add-on is not necessary to play the game.